From the 1920s on one can locate a fascinating, global convergence of avant-garde anthropology and experimental cinemas. In Latin America, this has often resulted in the manufacturing of social utopias and calls for radical figurations of the New Man, often by blurring nationalist and cosmopolitan fantasies dreamt up between Old and New Worlds. Chilean exile film artist and theorist Raúl Ruiz belongs uneasily and dissonantly to this tradition. The program examines this discordance by screening some of Ruiz' little known short and small gauge films alongside the anthropological meditations of two of his contemporaries, Anna Maria Maiolino and Arthur Omar. The viewer is thus invited to experience and experiment with what Ruiz calls "trembling images." Opening the program is Brazilian Anna Maria Maiolino’s In-Out (Antropofagia), in which an insatiable mouth opens and closes repetitively, as it ingurgitates unidentifiable matter. Ruiz’s Le Don/ The Gift and The Film to Come search for an enigma by blending medieval philosophy, machine thinking, and modernist anthropology. While the former explores the gift economy between cinema and its multiple doubles, the latter is a mystical short that has a narrator telling us about a "strange philanthropical secret society" that has been in existence for seven years at a certain building. Its members, Philokinetes, devote their energy and money to studying and promoting a fragment of film they call 'The Film to Come'. 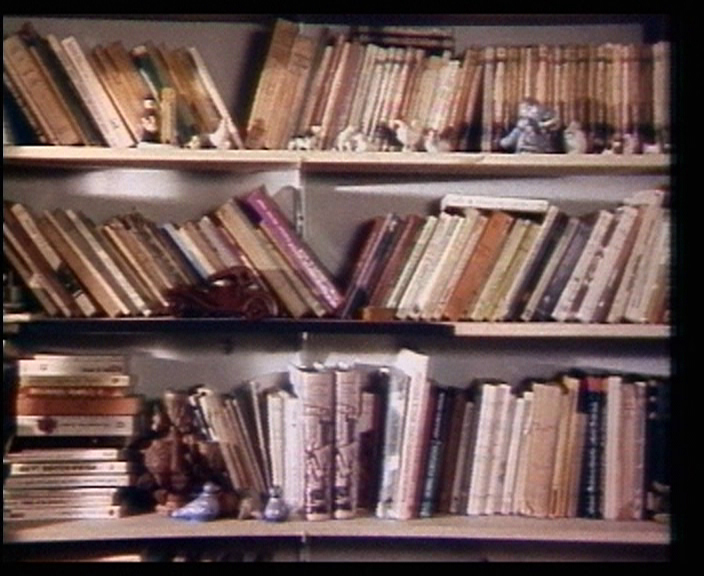 Shot in super 8mm, The Return of The Library Lover is a cinematic gem: a Borges-like hallucinatory promenade of a ghostly narrator erring in Santiago's urban landscape. Concluding the program is O livro do Raoul, Brazilian essay-filmmaker and photographer Arthur Omar's moving travelogue and film tribute to his friend Raúl Ruiz. Le retour d’un amateur de bibliothèques (El regreso de un ratón de biblioteca/The Return of a Library Lover, 1983). © L'Institut National de l'Audiovisuel.